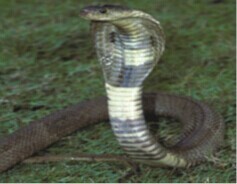 Snake envenomation is a serious health concern throughout the world especially in tropical and sub-tropical regions. World Health Organization (WHO) has included it along with other neglected tropical diseases since April 2009. Snake venoms are rich in protein called phospholipase A2 (PLA2) and their hydrolysis of cell membrane phospholipids explains the role of the protein in venom toxicity. Studies have shown that snake venoms PLA2 need submicromolar concentrations of calcium to be catalytically active and that increase in calcium is needed for both binding and catalysis. Detailed understanding of the role of calcium in phospholipase A2 toxicity is very important for design of phospholipase A2 small molecule inhibitors as none is presently available as drug in the market. Prof. Akubugwo and co-workers have shed more light into the mechanism of action of calcium in snake venom toxicity which could be helpful to design small molecules that can function as novel inhibitors of PLA2 as none is available as drug in the market. 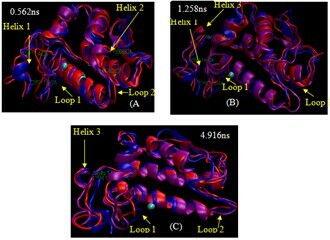 They explained that calcium induced formation of helical structures between Arg62 - Lys66, Asn107 - Tyr111 and Asp114 - Cys119 in PLA2 which with time disappeared through the formation and opening of loops as can be seen in the image below. They stresses that calcium induced atomistic movements and conformational changes in snake venom PLA2 which led to the formation of a widened cleft at the active site of calcium bound PLA2 when compared with free PLA2 and that this could lead to a better binding and accommodation of substrate, thus enhancing catalysis. They suggested that such inhibitors of PLA2 would likely act by inhibiting the formation of loops, its flexibility and/or stabilization of the generated helical structures which would prevent the widening of the cleft at the active site of PLA2. Any molecule with such a mechanism of action would be a potent inhibitor of PLA2. The search for small molecule inhibitors of PLA2 is important because antivenom immunotherapy is the only treatment available against snake envenomation presently. Also, antivenom immunotherapy has many side effects and its development and standardization is expensive and requires ideal storage conditions which may be lacking in the usually remote snake endemic areas. The authors employed molecular dynamics simulations of free PLA2 and calcium bound PLA2 using GROMACS 4.5.5 to evaluate the role of calcium in the function of PLA2. Snapshots of PLA2 obtained from molecular dynamics simulation at (A) 0.562 ns, (B) 1.258 ns and (C) 4.916 ns. Blue represent PLA2 at 0.0 ns, red is free PLA2 while purple is calcium bound PLA2. Loops and helical structures are coloured yellow. Calcium is represented as light green sphere. Image credit: Author. Prof. Chilaka Ferdinand C, Department of Biochemistry, Faculty of Biological Sciences, University of Nigeria, Nsukka, Enugu State, Nigeria.